On July 7th 2005, Peter Power was running a terror exercise which, in his own words that evening, was "based on simultaneous bombs going off precisely at the railway stations where it happened this morning, so I still have the hairs on the back of my neck standing upright!". He has since refused to give a more detailed account of his activities that day, for some reason believing that the commercial interests of his client, which require confidentiality, are more important than the public interest in incidents which resulted in many deaths and injuries. Disappointingly, the media appears to share that belief as it has not insisted on him making a credible full disclosure. Instead, it continues to present him with regular opportunities to propagate his views on such matters as the necessity of a 90 day detention period. J7 has discovered, though, that Peter Power was once the subject of a file passed to the Director of Public Prosecution as a result of an investigation by Dorset Police. This is all the more remarkable because, at the time, Peter Power was a Superintendent in the Dorset Police Force! Read the full story here. He retired from Dorset Police, which had suspended him on full pay, on the grounds of ill health before any decision was taken by the DPP on whether to act upon the file. This information dates from 1993, before the Internet was as commonplace as it is today. It is not online, so J7 is grateful for the services provided by public libraries and archives. It is a salient reminder of the importance of these services, which are increasingly under attack. Peter Power was in fact working for Dorset Police 1990-1993. What is the explanation for the incorrect biographical information supplied for the Panorama programme "London Under Attack"? 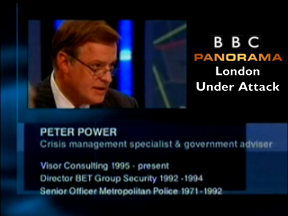 Is there evidence for the claims made by Peter Power about his involvement in the Brixton riots, the Libyan embassy siege, the Oxford Circus fire and the Kings Cross fire? Was Peter Power prosecuted as a result of the Dorset Police investigation? Is Peter Power still receiving an ill health pension from Dorset Police, at the same time as he is very actively pursuing a consultancy career? Why, in view of his apparently glittering career and obvious appetite for self publicity, with every prospect of attaining one of the top positions in the Met, did Peter Power transfer to Dorset? What precisely was the exercise undertaken on 7th July 2005, and which organisations were involved? http://tinyurl.com/yu82dh ,on my website. I'd be honoured if you took a look and spread the word. Thanks for the heads-up on this. You are to be commended for your bold and principled stand in response to Power's comment. Peter Power: "I have previously accused you of libel and note that you continue to publish defamatory information that is also libellous. 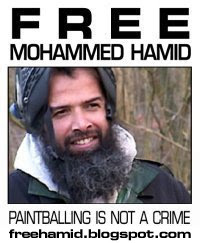 I retired after - not before - the CPS (not the DPP) made a decision that no prosecution was required. Remove what you have said or I will, without doubt, take action against you with no further warning." Mr Power appears to be getting a little confused in among all the crisis management, back-peddaling and endeavouring to cover-up the missing three years of his working life. It is true that Power has threatened someone before, however that threat was issued to someone by the name of Chris Bollyn who took J7's original research and turned it into something else entirely. You can read Bollyn's article here. "He [Power] was suspended following an internal police inquiry earlier this year after which a file was submitted for consideration to the Director of Public Prosecution". "The Crown Prosecution Service has been sent details of an investigation into a senior police officer with the Dorset force. Dorset police confirmed yesterday that Superintendent Peter Power, the officer in charge of the west of the county, has been suspended on full pay since April but refused to outline the allegations against him." The primary issue here is not whether it was the DPP or the CPS, for they are, to all intents and purposes, the same thing. A secondary issue is the manner in which Mr Power has omitted from his curriculum vitae any mention of his nettlesome stint with the Dorset Police and his potentially criminal activity that resulted in his suspension, investigation and, ultimately, the submission of a file to the DPP/CPS. "I retired after - not before - the CPS (not the DPP) made a decision that no prosecution was required." "I can confirm that from this record it would appear that the file was received by the CPS on or about 19th/21st July 1993. There is also an indication that a decision on how to proceed with this case was made on approximately 28th October 1993." "A West Dorset senior policeman currently under suspension from duty is to retire early on medical grounds. Superintendent Peter Power (42) will leave the force on September 26." 26th September 1993 is 32 days before 28th October 1993, which would seem to suggest that Mr Power's "retirement", apparently on medical/health grounds unconnected with the police investigation, occurred over a month before the CPS reached a decision on how to proceed with his case. Further to your email dated 7 March, I can confirm that the CPS archive record shows no further action was taken and subsequently no CPS prosecution followed.